5150 Battalion Commander - THE Big Battle Sci-Fi Game! 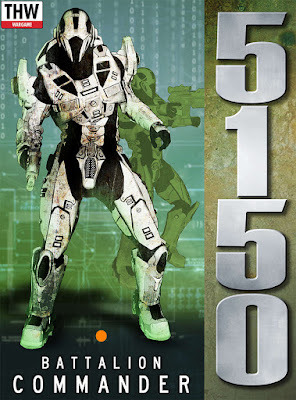 In 5150 Star Army you were a Platoon Leader in charge of three squads and with a little experience it became a company. But now all that’s changed. In 5150 Battalion Commander you’re in control of a battalion. Three companies! But don’t worry; it’s a bit of a learning curve so we’ll start you out with one company. Before you know it you’ll be up to speed. And you better do it quickly as there are new enemies to conquer in addition to the Hishen and Bugs from 5150 Star Army. Remember, it’s not a job, it’s an adventure and this adventure will let you play with cool new toys. · Rules for infantry, mechs, vehicles and aircraft on a larger scale. · A pre-generated mini-campaign linking your Missions, yet still allowing you to play one-off battles when desired. · Complete campaign system that rewards your successes and punishes your failures. · Increased gaming scale where each squad consists of two stands allowing for bigger games, while maintaining the realistic feel of men under fire found in 5150 Star Army. Like all THW games Battalion Commander can be played solo or same-side, against the game mechanics or head-to-head against your friends.